Every metal fan, no.. Every music fan must have come across this feeling. It doesn’t sit well with you and it feels a bit like betrayal. To the music? To the people writing the music? To yourself, because you were fooled by your own expectations? This unpleasant feeling one has to experience when walking the path of being a music fan: wanting to like an album, but you simply can’t. It’s been four years since Norwegian melodic black metal band Iskald dropped their last album, Nedom og Nord. Admittedly, I’ve lost sight of the two piece for quite some time. Still, their blackened tunes have been stored in the memory as something that was akin to my taste. When Innhøstinga first surfaced, it seemed like a perfect way to reconnect with Iskald. “The Atrocious Horror,” kicks off the record. It opens with a whirlwind of distorted riffs and in between settles with a cheesy riff and melody. It’s melodic black metal, like you’ve heard quite some times before already. “No Amen” breathes a similar vibe. The song ticks all the boxes: it’s aggressive, the vocals have that gory, nasty sound and the (again common) riffs alternate with the guitar chaos reminiscent of a blizzard that Iskald craftily manages to create. Yet, “No Amen,” peaks nowhere, as it is with most tracks on this album. Another thing that stings about Innhøstinga is the sound. 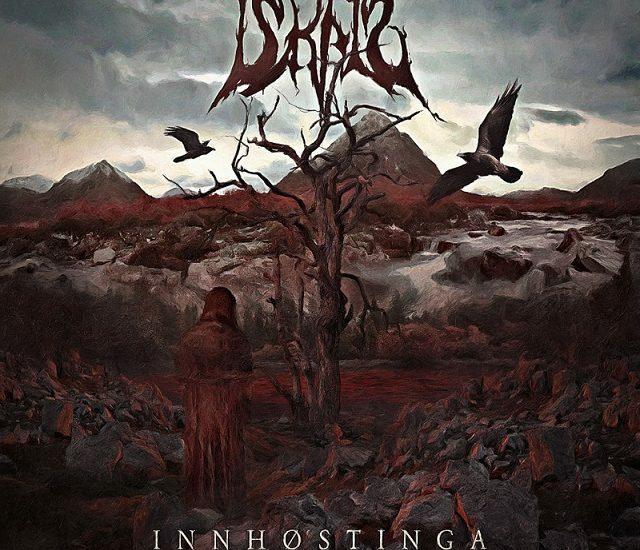 Even though flirting with dissonance is almost a must these days, Iskald’s execution of this musical element doesn’t do the trick. When used ‘right’, it will sound uncomfortable, but in the end it will enrich the song, giving it even more power. Instead, what you hear on Innhøstinga is an almost painfully sharp tuned guitar, that almost forces you to turn it off. My spirit lifts a bit when coming to “Even Dawn Drew Twilight.” The dynamics of the song, the overall fast pace and energy make up for the blandness (forgive the word) of the previous tracks and are for a welcome change. The same goes for “De Siste Vintre,” which combines the piercing ferocity of black metal, with a low, melancholic feeling due to the low tempo. It’s one of the tracks that proves that this album does have intensity tucked away. Still, as much as I hate to say it, a couple of pretty decent tunes do not clear this record. Innhøstinga is by no means a bad album, it doesn’t lack creativity in songwriting and the musicianship is on point. The big pitfall is the absence of monumental highlights, or an element that will lift it above a standard melodic black metal formula, beyond mediocrity.